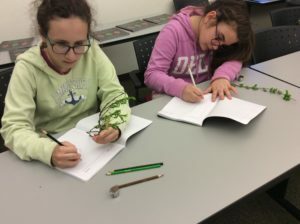 Last month students from Windham-Ashland-Jewett (WAJ) Elementary School Science Club were waylayed by the rain so decided to become indoor naturalists during one of their regular sessions hosted by the 4-H Program of Cornell Cooperative Extension of Columbia and Greene Counties (CCE). Club participants got to test their powers of observation and their knowledge of ecosystems at CCE’s Agroforestry Resource Center in Acra. Participants picked one tree or plant sample to observe and sketch in their field journals. Students were invited to think about the roles that plant might play in an ecosystem as well as any potential impacts they might have. Deb Valerio, teacher at WAJ, and Andrew Randazzo, CCE Environmental Educator helped the students connect all the plants and their functions into a forest ecosystem canvas that they created. The group overlaid the plants and sketched the animals in a manner they felt would create a healthy forest. Afterwards, they explored the impacts that development might have on the forest and created a verbal development plan that would help to minimize any negative consequences of building on the site. The WAJ Science Club would not be possible without the generous financial support of The Windham Foundation. The next session of the program is scheduled to take place in June and will cover topics related to stream ecology.